The weather is warming up and it's time to come out of hibernation! 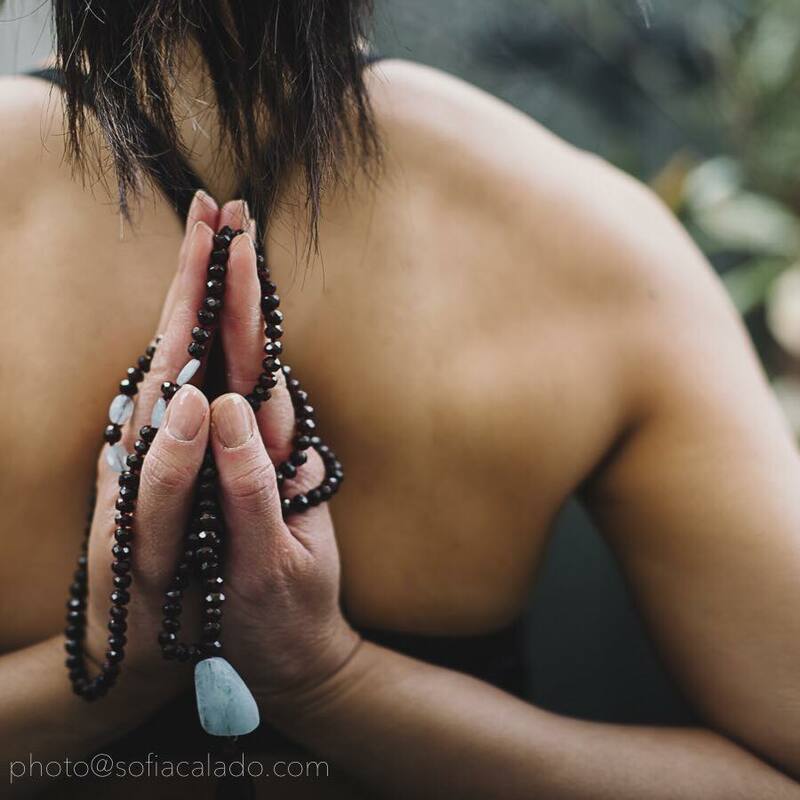 I have a fantastic venue in Norwood (just off Fullarton Road) which is a photography studio with lots of stunning artwork and sprung flooring that lends itself perfectly to a vinyasa style yoga practice. 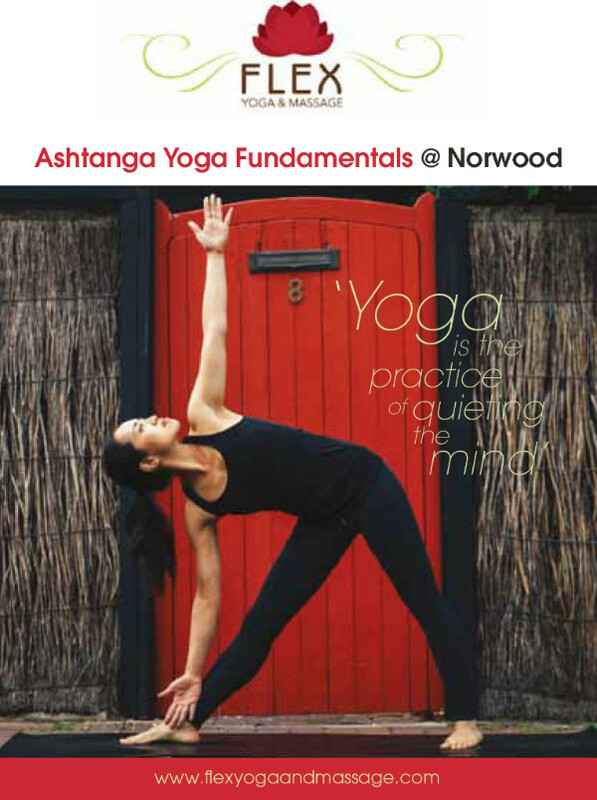 I'm really looking forward to running a public class again and going back to a traditional Ashtanga style class. I'll be teaching yoga here on Wednesday nights (6:45pm-8pm) for 8 weeks, commencing in October. 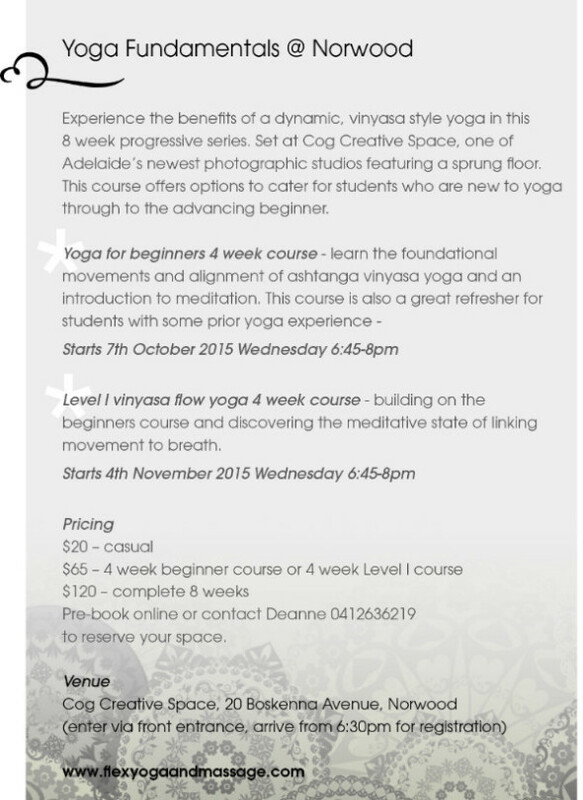 The first 4 weeks (October) will be a beginners course suitable for students with no prior yoga experience. We'll break down the basics of ashtanga style yoga (breath, bandha, drishti), learn correct alignment in postures and also learn to be still in an introduction to meditation. The second course of 4 weeks (November) is "level 1" and will build on the sequence we have already learnt in the beginners course, sequentially adding on new postures and focusing on linking breath and movement as we become more familiar with the series. If you have previously attended my beginners course or if you have some yoga experience, you may wish to start the yoga course from week 3 once we start to flow. I'd love to see some familiar faces at Norwood! Please let your friends who have wanted to try yoga "one day" know, as this is the perfect opportunity to get started in a non-intimidating way. No mirrors and hot pants in this studio! Yoga class payment is available from this link. I have been super busy over Winter and in between moving houses, working and teaching corporate yoga classes, I managed to sneak in a week long trip to Bali and a 1 week yoga teacher training course in Melbourne with David Swenson (USA), the author of the first Ashtanga yoga book and video I ever bought! Russell and I will be bringing back Mat 2 Plate - our yoga and fun dining experience event, in November. Check out our Facebook page for the professional photos from the night. Video to come soon! As always, you can find me at Flinders Onesport Fitness gym each Sunday 10:15-11:15am.